Ide Hintze, poet & performance artist, who also created the Schule für Dichtung in Vienna 20 years ago, passed away yesterday. Anne Waldman, who sent me the little remembrance below just informed me of these sad news. At the bottom of the post a video of Hintze performing at the international poetry festival in Novi Sad, Serbia, August 2008. I remember Ide’s unique creative eccentricity, his curious restless mind. His obsession with Sappho– his trips to Lesbos. How we were both inspired by the legend of her creating a school – a misopholon domos for poetry. I remember Ide’s deep sense of poetic continuum. His sense of pride and honor of the Viennese lineages. Being able to hear H.R. Artmann, Gerhard Ruhm, Ernst Jandl, Fredericke Mayrocker read through the auspices of the Schule in the early days was a great privilege for me personally. 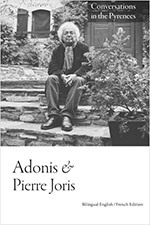 I remember Ide’s visit to The Jack Kerouac School at Naropa University in the 1980s with other brilliant poets and thinkers Christian Loidl and Christina Huber, how Ide sat at the feet of Allen Ginsberg to receive “transmission” for his work and creation with these others of the Schule fur Dichtung. I remember my sense of his gifts as an “infra-structure poet”. And how I admired his special talent as a cross-genre hybrid writer and performer. I remember the wit of his pedagogy. Holding workshops in a swimming pool, and a poetry float in the local parade down the streets of Vienna. I remember our rock n’ roll poetics weekend with Nik Cave, and how I argued that the rock stars would teach for one weekend , but the poets would teach for a century! I remember Ide’s organizational skills, and the dignity and decorum of the environment he created for SfD “doings”. I remember how warmly he welcomed the poets from across the Atlantic: Anne Tardos, Jerome Rothenberg, Jack Collom, Allen Ginsberg, Ed Sanders, Steven Taylor, myself. That we, and the Kerouac School were part of the lineage and the plan. It is a great testimony to Ide’s perspicacity and energy that the SfD has existed 20 years, something to celebrate and honor. Most of all I miss his friendship and the conversation: the inquiry, the quirky intelligence and generosity.